First off, I wish the passengers on this week&apos;s diverted cruise are still having a great and safe time away from hurricane Irma. May your journey home be as smooth as one can hope as well. Secondly, the major talking point of the ship is the "speed restriction" enforced during our time on the ship. I guess it is a less alarming way to say "we have a broken motor/propeller". My attached photo will show everyone that the ship is indeed only operating on two motors. Did that bother me? Not really, I thought the ship still moves rather briskly and never felt it was under powered. The only gripe is the shortened time spent at Nassau. We really liked an extra 2 to 3 hours more so we can visit Atlantis resort as well. Too bad. Comparing our last cruise on the Oasis, the Allure seems to be a step up even though they are the same class of boats. Services are top notch and I especially admire the overall upkeep and cleanliness of the ship. I saw staff cleaning all the pillar bottoms of the Promenade at 6am in the morning. Food quality is superb both at the MDR and specialty restaurants. We have the dining package and tried Samba Grill, Chops Grille and Izumi (both regular sushi and hibachi). The latter appeared a bit over-rated and the quality of the steak is so-so. I do miss the hot rock dinner at Izumi on the Oasis. Even the MDR appears to up the food quality. I did two servings of lobster tails and the regular dinner selections are all above average. The soups are a bit on the salty side though. One additional tip, if you don&apos;t want to wait in queue for breakfast at Windjammer, go to the Solarium. I don&apos;t know why, but it seems nobody goes there! I can get to choose the table I like even on busy days and they serve fresh mangoes and papayas as well (not found in Windjammer). We had a great time aboard the Allure of the Seas, even more memorable as we cruised on the week right before the monster hurricane! First off, I wish the passengers on this week&apos;s diverted cruise are still having a great and safe time away from hurricane Irma. May your journey home be as smooth as one can hope as well. Secondly, the major talking point of the ship is the "speed restriction" enforced during our time on the ship. I guess it is a less alarming way to say "we have a broken motor/propeller". My attached photo will show everyone that the ship is indeed only operating on two motors. Did that bother me? Not really, I thought the ship still moves rather briskly and never felt it was under powered. The only gripe is the shortened time spent at Nassau. We really liked an extra 2 to 3 hours more so we can visit Atlantis resort as well. Too bad. 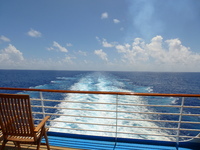 Comparing our last cruise on the Oasis, the Allure seems to be a step up even though they are the same class of boats. Services are top notch and I especially admire the overall upkeep and cleanliness of the ship. I saw staff cleaning all the pillar bottoms of the Promenade at 6am in the morning. Food quality is superb both at the MDR and specialty restaurants. We have the dining package and tried Samba Grill, Chops Grille and Izumi (both regular sushi and hibachi). The latter appeared a bit over-rated and the quality of the steak is so-so. I do miss the hot rock dinner at Izumi on the Oasis. Even the MDR appears to up the food quality. I did two servings of lobster tails and the regular dinner selections are all above average. The soups are a bit on the salty side though. One additional tip, if you don&apos;t want to wait in queue for breakfast at Windjammer, go to the Solarium. I don&apos;t know why, but it seems nobody goes there! I can get to choose the table I like even on busy days and they serve fresh mangoes and papayas as well (not found in Windjammer). We had a great time aboard the Allure of the Seas, even more memorable as we cruised on the week right before the monster hurricane! At first we were a bit worried that the room was located right above the lifeboats that it may restrict some views. Not so! 6th floor and being close to the stairways proved a blessing as well as you can just take the stairs to most of the popular spots like the Pormenade (5/F), Central Park (8/F) and all of the main dining rooms from 3/F to 5/F without using the hopelessly crowded elevators. Great choice! Get to see Half Moon Bay from top of the hill plus a lot of interesting spots on the island. The tour van however, needs better air conditioning.